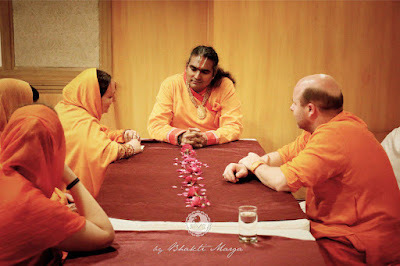 After the completion of the Atma Kriya Yoga retreat, we left very early in the morning on 4 May 2016 to Jaipur for the next part of the pilgrimage. The plan is to spend four days in the holy city of Jaipur visiting the famous temples of the city. The trip from Vrindavan to Jaipur was approximately 5 hours (taking into account Indian traffic), the time was spent singing bhajans and of course, periodically stopping to have a chai tea. 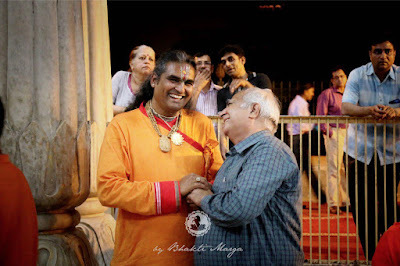 After arriving in Jaipur, the group went directly to the airport to welcome Sri Swami Vishwananda, as he was flying into India from Frankfurt, Germany. After a quick lunch we set out for our first visit to the temples of Jaipur. 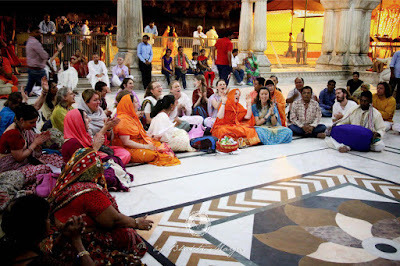 The first temple we visited in Jaipur was the Govind Dev Ji temple. 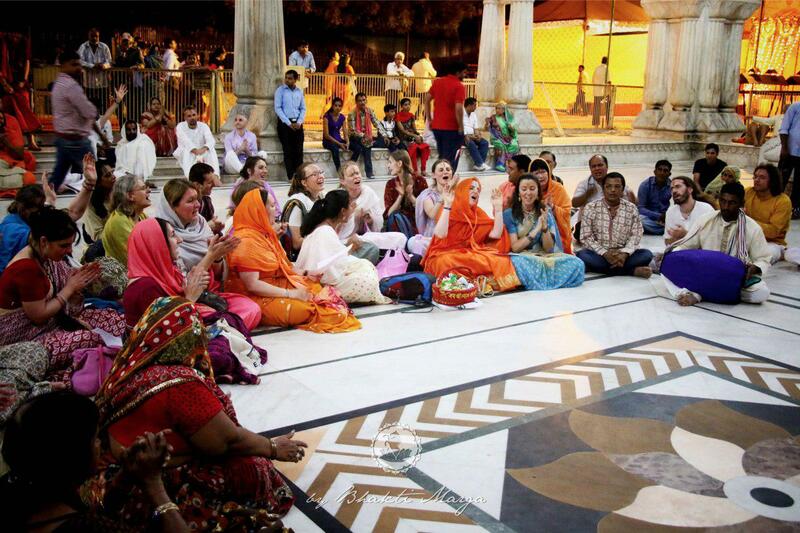 It is the most well known temple in Jaipur, and thousands people visit it daily. The murti in the temple is of Krishna, and the story of it goes back thousands of years. 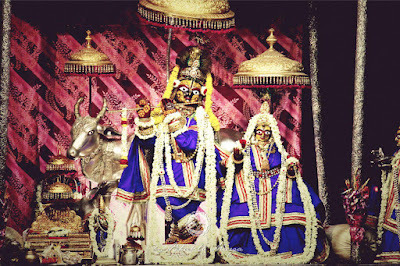 Sri Krishna ́s grandson Vajranabha had three deities carved according the descriptions of Krishna. When they were finished, it is said that Govinda Dev had the same face as Krishna. 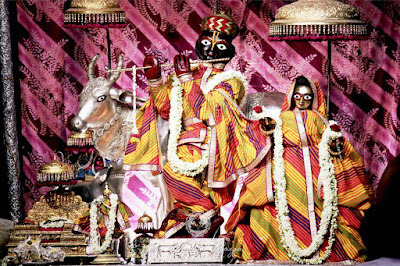 The murti was then installed in Vrindavan and opened for devotees to worship. In the 16th century, Vrindavan was abandoned and only deep forests remained there. It was the appearance of Sri Chaitanya Mahaprabhu that brought the discovery of this Sri Krishna deity in Vrindavan. Then, during the years of the fanatical Muslim attacks on the hHndu temples, the deity was taken away and hidden in Jaipur. 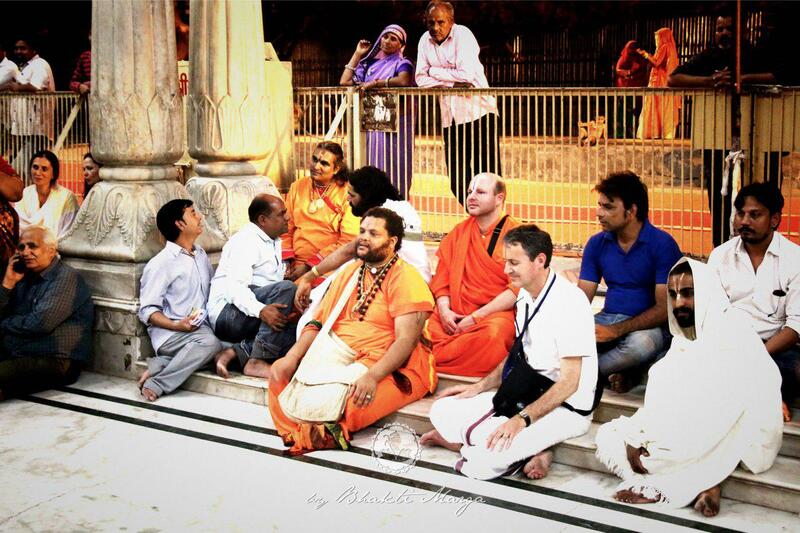 After having Darshan of Govind Dev Ji, the entire pilgrimage group started to sing kirtan at the temple. We ended up staying at the temple for nearly two hours. As many people were drawn to the large western group and kirtan, Guruji in his humility gave time to many of the curious onlookers and blessed each one that came to him. On Day 2, the group starts early with temple visits, and also a satsang with Guruji - stay tuned.